WASHINGTON — Scientists warned yesterday that oil from the spill in the Gulf of Mexico is moving rapidly toward a current that could carry it into the Florida Keys and the Atlantic Ocean, threatening coral reefs and hundreds of miles of additional shoreline. Government officials insisted that the oil had not yet entered the gulf’s so-called loop current and said they are continuing to monitor the movement of the spill closely. But two independent scientists, analyzing ocean current and satellite data, said the oil is in an eddy that is quickly being drawn into the current, portending a much wider spread of the hazardous slick. Technicians from BP, the company that leased the drilling rig, said yesterday that they are still suctioning oil from the drilling pipe lying on the ocean floor 5,000 feet below the surface. They are pulling oil out through a narrow tube at the rate of about 1,000 barrels a day, roughly a fifth of the official estimate of the total leak. Doug Suttles, BP’s chief operating officer, said the tube could accommodate at least 5,000 barrels a day, but engineers are increasing the flow rate very carefully to avoid sucking up water, which might lead to the creation of the icelike structures, called hydrates, that form in the presence of seawater at low temperatures and high pressures and could clog the pipe. 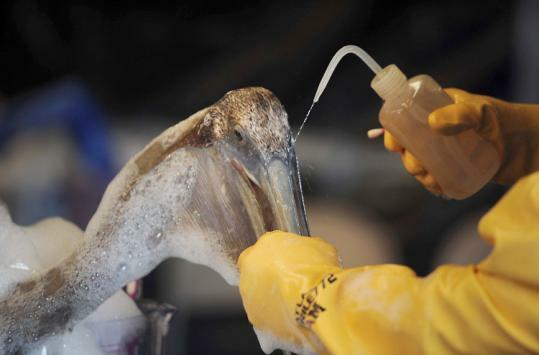 Millions of gallons of oil have already escaped from the blown well, presenting an enormous challenge to contain it and keep it from killing ocean life and fouling Gulf Coast beaches and wetlands. That task will become immeasurably more difficult if the huge plume of oil moves into the powerful and unpredictable loop current, which carries warm water in a clockwise motion from the Yucatan Peninsula into the northern Gulf of Mexico, then south to the Florida Keys and out into the Atlantic. But the independent scientists said that a portion of the wide oil slick is circulating in an eddy directly north of the loop current. This eddy, known as a cyclone, spins counterclockwise and is dragging the oil south. Hu estimated that oil that enters the current could reach the Florida Keys in roughly two weeks. A new round of congressional hearings into the spill opened in Washington yesterday, with the Senate Committee on Homeland Security and Governmental Affairs taking testimony on the government and private sector response to the spill.